N-Line® Valves provides engineered flow control solutions for upstream oil and gas production. Control Chokes and Valves are available in a full range of materials and configurations size 2" to 16" and pressure classes ASME 600 to 2500, API 2,000 to 20,000. Valves are qualified for API-6A (ISO-10432), API 17D (ISO 13628-4) and ASME B 16.34. The design is reviewed and approved by agencies such as ABS, DNV, Lloyds and Bureau Veritas. The valves are flow tested to ISA 75.02 and sizing according to ANSI/ISA S75.01 and IEC 534-2. Choke Valves. The range of choke design covers API, ASME and DIN ratings up to API 20000 and ASME 2500, sizes from 2,5" to 12". Material: Carbon and Alloy steels, Stainless Steel, Duplex Steels and Clad with corrosion resistant Alloys. 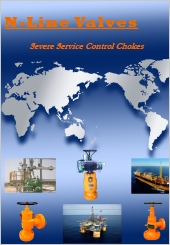 Subsea Valves and Chokes. N-Line® valves has designed, manufactured and supplied specialized subsea poducts since the company's inception. Products rated at API 15,000 psi and depth rated to 10,000 ft. are the normal. 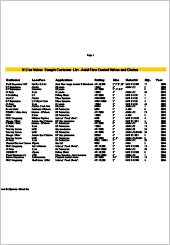 Information on subsea products that are application specific upon request. Axial Flow Control Valves. N-Line® Valves offers its Patented Axial Flow Control Valves in sizes to 12" and pressure ratings to API 10,000 and ASME 2500. This unique design offers the advantages of N-Line's Cage Trim with the efficiency of quarter turn operation. As with other N-Line® valves, construction is from forged steel and trims in stainless steel and tungsten carbide provide solutions to the toughest flow control challenges.